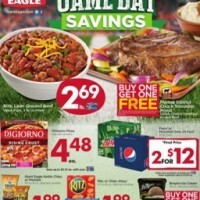 Giant Eagle Ad – Leap Into Savings! 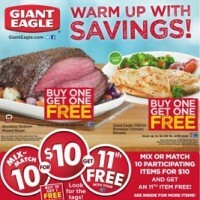 Giant Eagle Weekly Sale Ad – Warm Up with Savings! 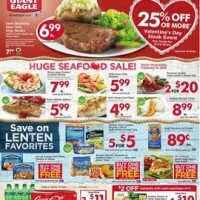 Giant Eagle Weekly Ad February 11 – 17, 2016. 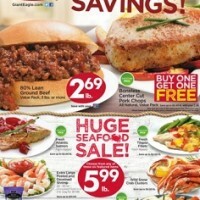 Huge Seafood Sale! In 1931, five families—Goldstein, Porter, Chait, Moravitz, and Weizenbaum — combine forces to form Giant Eagle. The first Giant Eagle supermarket opens on Brownsville Road in 1936. Throughout the 30s and 40s, through the hardships of the Great Depression and World War II, the chain of Giant Eagle supermarkets and OK Grocery Food Stores grows steadily throughout Pittsburgh-area neighborhoods. Today, Giant Eagle operates more than 200 stores, with the purchase of Riser Foods in Cleveland and County Markets in Maryland. Giant Eagle now has stores throughout Western Pennsylvania, Central and Northern Ohio, Northern West Virginia and Western Maryland and employs over 35,000 throughout stores, warehouses and corporate offices. Major cities in which Giant Eagle has stores opened: Columbus, Cleveland, Pittsburgh, Akron, Canton, Youngstown or Erie. 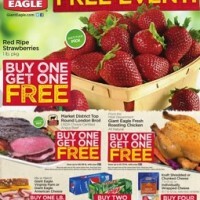 Latest Giant Eagle ad, Giant Eagle weekly ad, circular, flyers and weekly specials. Top deals and coupons in a single place.